Ask any English soccer fan who is the one team that England always wants to beat and they will answer Germany. Since England beat them to won the 1966 world cup several times often in a penalty shoot out the Germans have put an end to England dreams. So saying guess who Enland play in the next round of the soccer world cup. None other than Germany once more. While ex yers are predicting another shoot out win, the folk at Oberhausen Sea Life Aquarium have the prediction from one of there own. 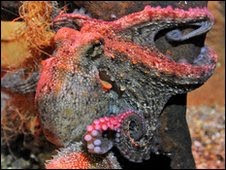 "psychic" octopus is said by its aquarium owners to have predicted the country's football team will knock England out of the World Cup. His keepers say he correctly predicted nearly 70% of Germany's results during the 2008 European Championship. In that contest, Germany finished as runners-up in their qualifying group, having lost only once to Croatia. They then progressed to the final, where they were beaten by Spain. If keepers at the Oberhausen Sea Life Aquarium are right, he correctly predicted the outcome of four of the six games in that competition. "Paul's prediction was phenomenal," said aquarium spokesman Tanja Munzig. "He swam straight over to the German glass, climbed in and even put a lid on top once he was sitting inside." The octopus, which was born in the UK and was moved to the German aquarium, has become a national celebrity after correctly predicting Germany would beat Australia in their opening match, then lose to Serbia, and then beat Ghana. His latest prediction was flashed all over the German media. The container that Paul opens first is said to be his pick for who will win the impending match, keepers say. Germany finished the initial stage of the World Cup top of Group D, and face England, the runners-up from group C, in Bloemfontein on Sunday. Sounds like a good pet to have around when playing the lottery.